Stay for a weekend at our Portsmouth, NH bed and breakfast and see two great market events: the Portsmouth Farmer’s Market on Saturday followed by the Open Market at Strawbery Banke Museum on Sunday. Every Saturday through mid-October 2011, enjoy the Portsmouth Farmer’s Market at City Hall from 8:00 am to 1:00 pm, rain or shine. Local vendors bring the freshest vegetables, cut flowers, honey, maple syrup, fish, eggs, and meats. Other stalls boast home made baked goods, cheeses, loose teas, granola, pies and grilled meats for eating or taking home. A few artisans bring their wares such as hand spun and dyed yarns, hand thrown pottery, jewelry, and woven baskets. Music, laughter and friends catching up on the week’s gossip make for a festive atmosphere for locals and visitors alike. 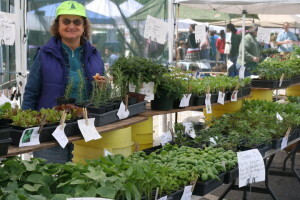 Most Sundays through late October 2011, Strawbery Banke Museum hosts its first Open Market. A venue which includes a farmer’s market as well as a craft market. Local artisans and craftsman display and sell their creations. This is the market’s first year of operation, so it is small (about 30 vendors) but we hope it will grow in size. As a side benefit, stroll over to see the building of the second replica Gundalow (river boat). Parking is free at the farmer’s market, but $10 at the open market. Better to stay at the Martin Hill Inn and leave your car with us!